Now I had the opportunity to change this to a better model, a RaidSonic IB-865. This is a plug-in module for a 3.5″ drive bay with card readers for all current formats (except SmartMedia Card which obsolete anyway) and an external USB 3 socket. In total there are six slots for memory cards which can also be used at the same time, except M2 and MicroSD. However the latter one can also be used using an SD adapter. A blue LED indicates that the card reader is ready and a second LED indicates that a memory card is being accessed. Though the second LED on my copy is green and not red as shown on the picture by the manufacturer. The connection to the computer is internally using a 14 pin USB 3 connector for two ports. One port is used for the card reader, the other port is used for the external USB socket. Some reviews about this device mentioned the problem that the card reader was not being recognized and a firmware update was needed. However these reports are all at least six months old. My copy did not have these problems and I assume that all currently sold models have an up to date firmware now. 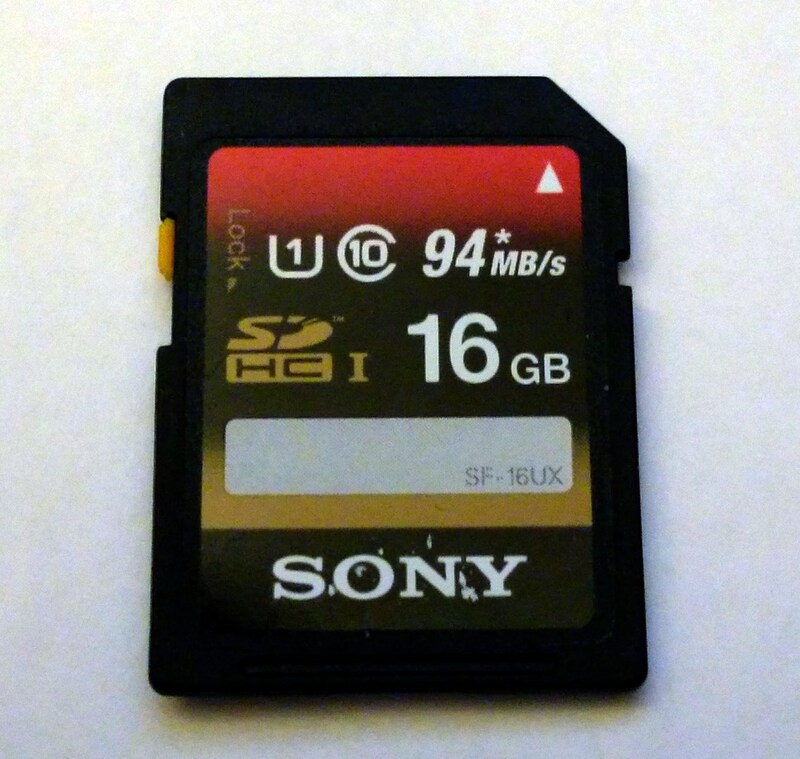 For a test I checked one of the memory cards which us in my DSLR with HD Tune. 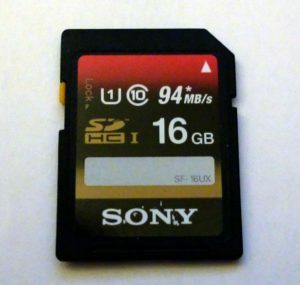 The card is a 16 GB SDHC card by Sony which is rated to deliver up to 94 MB per second. The result was quite convincing. 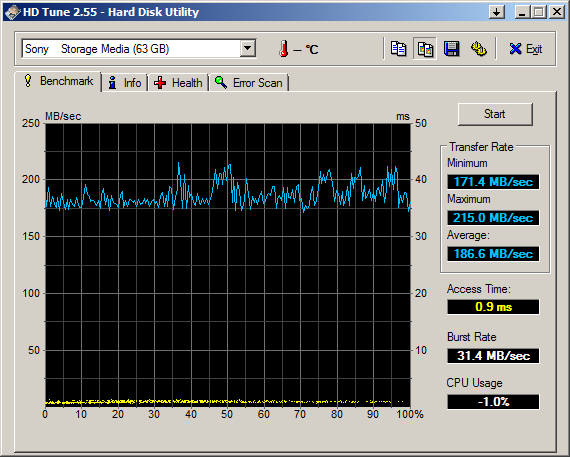 Even though the reached speed was lower as advertised on the card it is at 77 MB per second still much faster as with USB 2. Considering the price of about 20 EUR the RaidSonic IB-865 is clearly a recommendation for me. 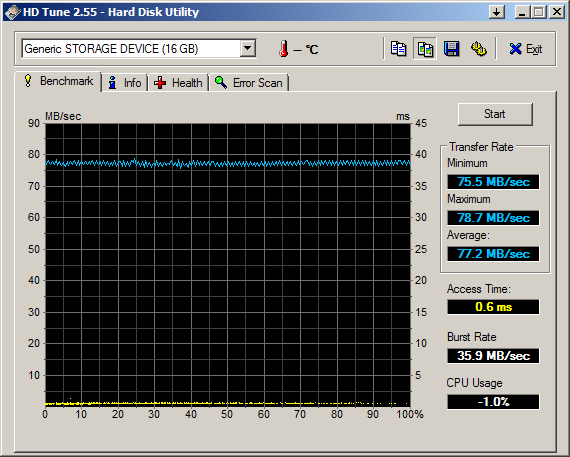 The card reader works reliable and fast and you also get a reliable external USB 3 socket.